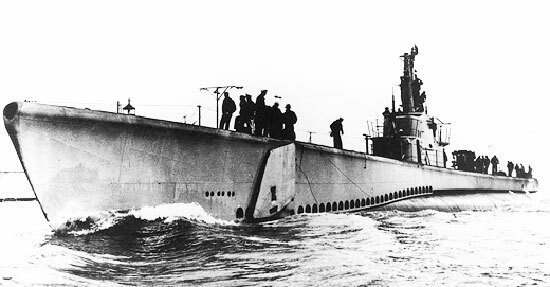 The following men were lost while serving on USS Lagarto (SS-371). If you are a relative or a friend of any man lost on this boat, please contact us. See the Submarine Discoveries page for information on the discovery of this vessel. See also The Lost Submarine (Amazon.com) for information on the book by Nancy Kenney, the daughter of Lagarto crew member William Tucker Mabin. For a brief history of the boat, please see The Loss of USS Lagarto. Some sources mistakenly omit Russell Willie Lee from their lists of men lost with USS Lagarto. The origin of this discrepancy is found in U. S. Submarine Losses (1946 and 1963, although he is listed in 1949) and in Christley. His individual personnel file in the National Personnel Records Center, St. Louis, Navy Casualty, DPAA listings, and muster rolls of USS Lagarto all confirm his being lost with his Lagarto shipmates. to the State of Wisconsin.